Chinese smartphone maker Huawei over the years has maintained its presence in India through its sub-brand, Honor, which has a strong line-up of budget and mid-segment devices in the country. Now Huawei is looking to supplement these with a high-end premium flagship which could easily give the likes of the Samsung a good run for their money. Following the global unveiling of the P20 and P20 Pro last month, Huawei India has started teasing the devices on its official website and social media handles suggesting that its India debut is just round the corner. Both the devices are being touted as perfect smartphones for photography enthusiasts and the teaser video shared by Huawei hints at the same as it shows colourful lines shaped as a DSLR converting into a phone. The Huawei P20 has been priced at EUR 649 (Rs 52,200 approximately) in Europe, while the P20 Pro costs EUR 899 (Rs 72,300 approximately). However, expect the two devices to come at a slightly lower price point when they finally make their way to India. Ahead of its Indian launch, let's see what the two phones bring with them. There is no denying that Huawei is focusing much of its energies on the P20 Pro, but to say that the P20 is no match for the flagships that currently flood the market currently will be wrong. The P20 is built upon a redesign of last year's P10 and available in variety of colours including black, champagne gold, pink gold, midnight blue and twilight. On the front, the phone features a 5.84-inch LCD display running at a resolution of 2240x1080 and 16:9 in aspect ratio. There's also an iPhone style notch at the top. Under the hood, we have a Kirin 970 processor with a 128GB storage and 4GB of RAM. There is also no headphone jack on the device as it has been replaced with a USB-C port. Though not as fancy as the setup on the Pro variant, the Huawei P20 is still pretty great for clicking pictures. The P20 comes with a dual camera setup – a 12-megapixel colour and 20-megapixel monochrome. The selfie camera on the front has been pushed up to a respectable 24-megapixel too. The phone also brings with it the ability to capture videos at 4k, 30fps, and also in Super Slow Mode. In terms of the OS, the device comes running EMUI 8.1 based on Android Orea 8.1 that looks heavily inspired by iOS. Keeping the lights on is a 3400mAh battery, which can be fast charged using Huawei's fast charger. The beefier of the two, the P20 Pro is definitely the star of the show and as such has been equipped with specs to make it an industry leader. The phone comes flaunting a bigger and technologically superior 6.1-inch (2240x1080) AMOLED display at an 18:9 aspect ratio. Under the hood its the same powerful Kirin 970 platform, 128GB of storage but 2 more GBs of RAM for smoother performance. In terms of the cameras, the P20 Pro is an absolute beast. Huawei and Leica have collaborated here to build a truly unique camera system that features not two, but three lenses placed vertically. On paper, this makes it arguably the most powerful system seen on a flagship. 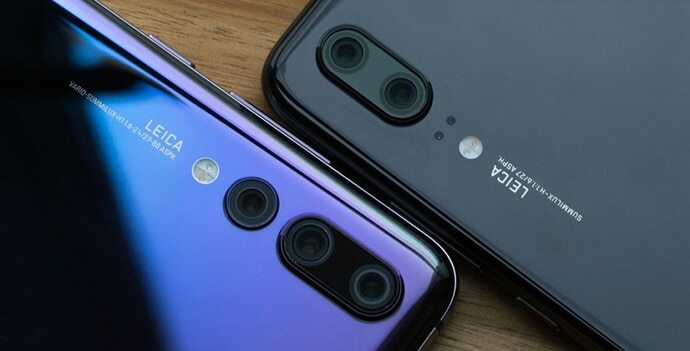 Of the three cameras, the first is a 20-megapixel monochrome camera, the second being a 40-megapixel colour lens and the third being an 8-megapixel telephoto lens. The 40-megapixel camera is what Huawei's focusing on as the phone's major selling point, even comparing it to DSLRs in its teaser videos. The particular lens features a huge 1/1.7” sensor, one that is much larger than any competing phone. Both the 40-megapixel camera and the telephoto lens have optical image stabilisation. Huawei's flagship also has an improved Laser autofocus system which now works up to 2.4m (twice as far as P10's Laser AF) and there's "4D autofocus" with motion prediction too. The phone is also bringing with it AI-backed features such as artificial intelligence stabilisation or AIS which works on object and scene recognition. AIS also comes into play during night shots with a Handheld Night Mode. The phone gets its juice from 4000mAh battery pack with Huawei SuperCharge.